As I mentioned in last week's piece, and as many who follow the industry know, it's not been a stellar year for beer. We've been seeing some pretty low growth numbers since before summer and there's no clear evidence that things have improved. But it's not all gloom and doom. A big part of what's happening in the overall industry is that light beer is imploding. Bud Light sales were down 4% for Q3 (July-September). Bud Light is just one of many premium and sub-premium brands losing steam. That lost volume is a huge drag on the industry as a whole. Thus, the funk. The craft segment is also underperforming, with single digit growth on the year. That wouldn't cause alarm if growth in recent years hadn't been in high double digits. When you're accustomed to year-over-year growth numbers like that, slower growth causes concern and, in some quarters, panic. Despite the sluggish growth year, things probably aren't as dire for craft beer as some of us have been led to believe. We may be approaching saturation in some areas, but the overall health of the industry is pretty good. 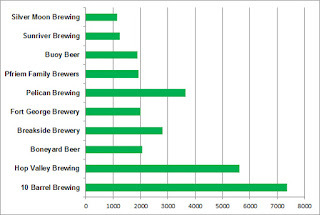 The above chart shows some Oregon breweries that are doing quite well here. As with the negative numbers chart below, these are August 2015 to August 2016 OLCC numbers, provided by a helpful assistant who does quarterly spreadsheets. My disclaimer, as always, is that OLCC numbers are hopelessly incomplete and useful only as a guide to trends. The list is comprised mostly of newer breweries formed within the last 10 years. These are brands that have flourished in recent times. Their beers have won awards and fans. Even 10 Barrel, which has unfair advantages over independent craft brewers, has produced some notable beers and continues to attract a following despite its ownership situation. Now look at the chart below. 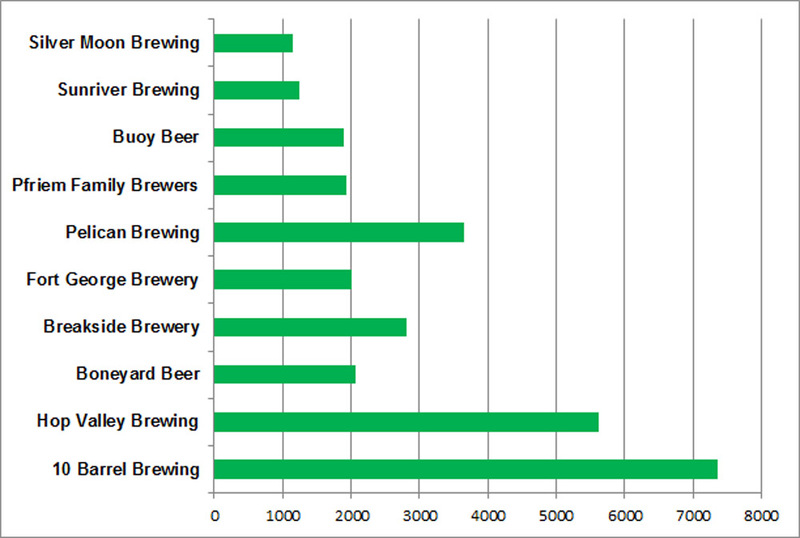 These are the breweries showing the largest negative numbers over the same period. Three of the five are older, established breweries. The developing trend in Oregon is that younger, vibrant brands are taking share from long-established ones. Why? Likely because consumers, when they have a choice, prefer beer made in newer, typically smaller breweries. The same trend appears to be gaining traction around the country. Small, local breweries are opening everywhere..the craft brewery count is now around 4,500. A lot of the new kids are taking share from established craft breweries, as well as from big beer. 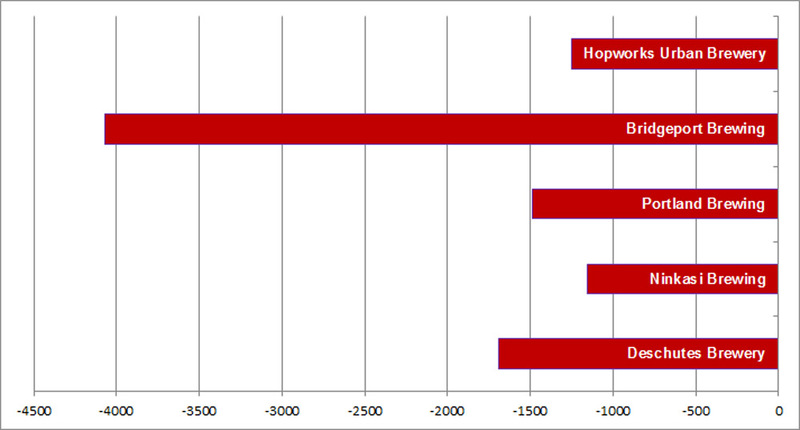 We are seeing this trend documented in IRI losses for older craft brands and big beer. So why are craft growth numbers sluggish this year? Probably because small brewery volumes aren't being fully captured in IRI stats. Why? Because an increasing amount of beer is being sold in breweries or at growler fill stations, pubs, beer beers and others places outside IRI view. It will take improved data collection to see the full extent of what's happening. For now, don't get too caught up in the notion that craft growth is faltering. A saturation point is coming. But we're not there, yet.